I was telling a friend recently that I love books that make me cry. The more tears I shed, the more likely it is I'll give said book a high rating. 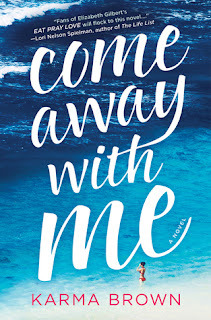 And Come Away With Me? It certainly brought on the tears. Tegan Lawson’s got it all. She’s pregnant with her first child and has a beautiful, loving marriage with her husband Gabe. Then her life changes completely when they get into a car accident. Overnight, Tegan becomes a woman filled with grief, anger towards her husband Gabe because he was driving and a sadness that seems never-ending. I think my heart ached a little more with each passing page as we see every facet — good, bad and ugly — of her process to find some sort of peace. But she doesn’t even want to heal most of the time until Gabe brings up their Jar of Spontaneity. It’s a jar filled with pieces of paper on which they had written down their dream destinations and experiences. He tells her to pull three from the jar and it puts them on a traveling experience that takes them to Thailand, Italy and Hawaii. The book alternates between their relationship before the accident and how they’re coping in the aftermath. In the before is where I really fell in love with Tegan and Gabe. The passion and partnership in their relationship had me wishing multiple times to find a love like theirs. I think us readers needed to see and feel that to understand the depth of their current pain. But it did make the switch back to the present that much more heartbreaking. The writer made it very easy to slip into Tegan’s shoes, whether she was happy or understandably depressed. As Tegan and Gabe begin their adventures, again the author makes it easy to see what they’re seeing. I was really impressed with the writing because I felt so immersed in the story from beginning to end. I wanted to experience Thailand, eat all the food in Italy and lie on the beach in Hawaii. But most of all, I wanted to be there for the moment when Tegan truly began to heal. The only reason I didn't give this book five stars (although I was very close!) was because of a transition later in the book which felt a bit jarring. Saying any more would be a spoiler but once you read, you'll probably see what I mean. I highly recommend this book, especially if you’re the mood to read something heart-wrenching. 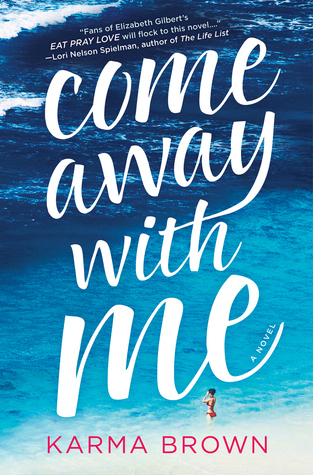 I was so surprised by how much I wound up loving Come Away With Me, even though I had predicted I would. Brown just really knows how to portray Tegan's emotional journey in the right way, and I loved it. I can't wait for her next book!